Gmail team seems to be in over-drive to keep you busy trying out new with Gmail. It recently got all color, design and jazz with Gmail themes. Here is new bump on Gmail accessibility front. You can access Gmail on desktop without opening web browser. This is possible using new Google desktop gadget ‘Gmail on your desktop’. 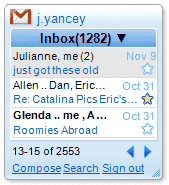 It shows cute window on your desktop which can be resized to show desired number ofÂ email messages. You can perform basic operations like reading, searching and sending messages. It also supports auto-complete, star messaged and keyboard shortcuts.